N 51° 33' 8" and W -0° 17' 48"
Wembley in Greater London (England) is a town located in United Kingdom a little west of London, the country's capital place. Time in Wembley is now 10:30 PM (Sunday). The local timezone is named Europe / London with an UTC offset of one hour. We know of 9 airports nearby Wembley, of which 5 are larger airports. The closest airport in United Kingdom is RAF Northolt in a distance of 5 mi (or 8 km), West. Besides the airports, there are other travel options available (check left side). There are several Unesco world heritage sites nearby. The closest heritage site in United Kingdom is Tower of London in a distance of 16 mi (or 26 km), East. Also, if you like the game of golf, there are several options within driving distance. We collected 5 points of interest near this location. Need some hints on where to stay? We compiled a list of available hotels close to the map centre further down the page. Being here already, you might want to pay a visit to some of the following locations: Ealing Broadway, Ealing, Harrow, Hammersmith and Hendon. To further explore this place, just scroll down and browse the available info. Let's start with some photos from the area. 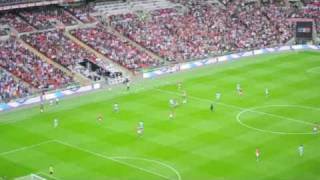 This is the BBC Highlights of the League 2 Play Off Final between Bradford City and Northampton Town. The copyright is wholly owned by The BBC and is uploaded for anyone who missed it. 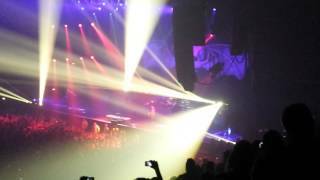 A7x afterlife Wembley Arena 1/12/13. Man City Supporters at FA cup Semi Final at Wembley. Millwall Fans Fighting at Wembley 13th April 2013. IKEA WEMBLEY FOOTBALL CLUB PLAYING AGAINST NETWORK HOUSING AT WEMBLEY POWER LEAGUE 5 A SIDE. 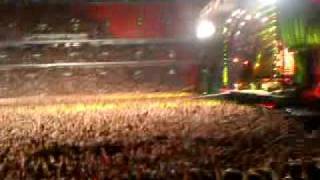 Highway To Hell - AC/DC Wembley Stadium - June 26th 2009. The original Wembley Stadium, officially known as the Empire Stadium, was a football stadium in Wembley, a suburb of north-west London, standing on the site now occupied by the new Wembley Stadium that opened in 2007. Debris from the Old Wembley Stadium was used to make the award-winning Northala Fields in Northolt, Ealing. Located at 51.5556, -0.279722 (Lat. / Lng. ), about 1 miles away. Wembley Arena (originally the Empire Pool) is an indoor arena, at Wembley, in the London Borough of Brent. It is located right next to Wembley Stadium. Located at 51.5581, -0.282972 (Lat. / Lng. ), about 1 miles away. The Hanger Lane gyratory is a large, complex roundabout system at the intersection of Western Avenue, the North Circular and Hanger Lane in the borough of Ealing in west London. It covers an area of about 30,000 square metres. At rush hour it carries nearly 10,000 vehicles per hour. An above-ground section of the London Underground Central Line passes under the roundabout. The island in the middle contains Hanger Lane tube station and a nature reserve. Located at 51.5303, -0.293056 (Lat. / Lng. ), about 2 miles away. The regeneration of Wembley is one of the major development projects in London in the early 21st century, as specified in the London Plan published by the Mayor of London Ken Livingstone in 2004. Wembley is a suburb in North West London. The regeneration project is focused on the site first developed for the Empire Exhibition of 1924. This area includes Wembley Stadium and Wembley Arena, both of which recently finished undergoing complete rebuilds. Located at 51.5581, -0.279722 (Lat. / Lng. ), about 1 miles away. Brent North is a constituency represented in the House of Commons of the UK Parliament since 1997 by Barry Gardiner of the Labour Party. Located at 51.57, -0.29 (Lat. / Lng. ), about 1 miles away. Park Royal & Twyford Abbey is a closed station on the route of the Piccadilly Line of the London Underground. It was located near Twyford Abbey Road a short distance north of the current Park Royal station which replaced it on 6 July 1931. The station was opened on 23 June 1903 by the Metropolitan District Railway on a new branch line to South Harrow and the Metropolitan Line tracks at Rayners Lane. Located at 51.5314, -0.289444 (Lat. / Lng. ), about 1 miles away. The White Horse Bridge is the name of the new (2006) footbridge that crosses Wembley Stadium railway station leading up to Wembley Stadium in England. It was designed by Steve Chilton for architects Marks Barfield and engineered by Halcrow. Located at 51.5543, -0.285577 (Lat. / Lng. ), about 1 miles away. The Ace Cafe London is a transport cafe in Stonebridge, north west London, England. It is a notable venue in motorcycle culture which originally operated from 1938 until 1969, then re-opened on the original site in 1997. Located at 51.5412, -0.2778 (Lat. / Lng. ), about 1 miles away. Wembley Football Club is an English semi-professional football club based in Wembley, in the London Borough of Brent, London, England. The club is affiliated to the Middlesex County FA. They currently play in the Combined Counties League Premier Division. They play in red and white and are nicknamed "The Lions". This is due to the presence of a lion in the coat of arms for the old Borough of Wembley. Located at 51.5576, -0.315861 (Lat. / Lng. ), about 1 miles away. Olympic Way, more commonly known as Wembley Way, is the road that links Wembley Park tube station and Wembley Stadium in London, England. Thousands of spectators walk along it to every event as the road leads directly into the stadium. The road is an easy access from the London Underground system to the stadium, and travels in a north-south direction. Located at 51.56, -0.279722 (Lat. / Lng. ), about 1 miles away. 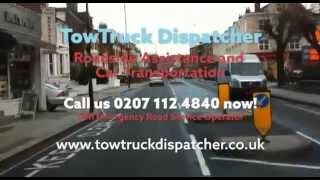 The Harrow Road is an ancient route in London which runs from Paddington in a northwesterly direction towards Harrow, northwest London. With minor deviations in the 19th and 20th centuries, the route remains otherwise unaltered. There are dozens of other existing roads throughout the United Kingdom using the same name which do not lead to or from Harrow but merely use the name of the town or, in some cases, a person of that name. Located at 51.5545, -0.31517 (Lat. / Lng. ), about 1 miles away. Wembley Central is an electoral ward of the London Borough of Brent. It was expanded in 2002 to include part of the Barham ward, which was abolished. Located at 51.551, -0.297 (Lat. / Lng. ), about 0 miles away. Wembley Stadium (or sometimes as the New Wembley) is a football stadium located in Wembley Park, in the Borough of Brent, London, England. It opened in 2007 and was built on the site of the previous 1923 Wembley Stadium. The earlier Wembley stadium, originally called the Empire Stadium, was often referred to as "The Twin Towers" and was one of the world's most famous football stadia until its demolition in 2003. It is a UEFA category four stadium. Located at 51.5558, -0.279722 (Lat. / Lng. ), about 1 miles away. The Wembley Central rail crash occurred on 11 October 1984 just outside Wembley Central railway station, Greater London. The 17:54 passenger train from Euston to Bletchley, formed by two Class 310 electric multiple units, collided with a Freightliner train which was leaving Willesden yard. The first two coaches of the passenger train overturned onto their sides and three passengers were killed; 17 passengers and the driver were injured. Located at 51.5496, -0.2933 (Lat. / Lng. ), about 0 miles away. Concert for Diana was a concert held at the then new Wembley Stadium in London, England, United Kingdom in honour of Diana, Princess of Wales, on 1 July 2007, which would have been her 46th birthday; 31 August that year brought the 10th anniversary of her death. The concert was hosted by Diana's sons, Princes William and Harry, who helped to organize many of the world's most famous entertainers and singers to perform at the concert. Located at 51.556, -0.27963 (Lat. / Lng. ), about 1 miles away. Wembley Conference Centre was a conference centre near Wembley Stadium, Wembley, in London, England. Located at 51.5572, -0.2847 (Lat. / Lng. ), about 1 miles away. Wembley Synagogue is a synagogue in Wembley, London in England. It is part of the United Synagogue family of synagogues and offers an extensive range of religious, spiritual and social activities. Located at 51.5622, -0.29 (Lat. / Lng. ), about 1 miles away. The A4005 is a suburban link road running between Hanger Lane roundabout, where the A40 meets the A406 (North Circular Road), and Harrow. The A4005 now runs along Roxeth Hill to its junction with the A312 in South Harrow, then merges with it northbound until its junction with the A404 before splitting away again to become Greenhill Way. Located at 51.5315, -0.2945 (Lat. / Lng. ), about 1 miles away. Preston ward is a political division of the London Borough of Brent that returns three representative Councillors and at the 2006 election was held by the Conservative Party's Bob Blackman, Alan Mendoza, and Harshadbhai Patel. Located at 51.568, -0.298 (Lat. / Lng. ), about 1 miles away. Alperton Community School is a secondary school located in Alperton in the London Borough of Brent. It has approximately 1200 students. The current head teacher is Margaret Rafee. The school is a specialist in Mathematics and Computing. In June 2011, it was deemed "Outstanding" by Ofsted's latest report. It is divided into two buildings; One on Ealing Road, near Alperton Station, and another one on Stanley Avenue. Located at 51.5433, -0.292778 (Lat. / Lng. ), about 1 miles away. Pacific Plaza was an Oriental shopping and food court complex situated in Wembley, London. It closed in April 2011. It aimed to be similar to Oriental City at 399 Edgware Road, but was much smaller and has much fewer facilities and shops. Pacific Plaza opened on the 5th December 2009 and had numerous restaurants and food court outlets, with an oriental supermarket which was due to open in early March 2010 but never opened. Located at 51.5587, -0.2783 (Lat. / Lng. ), about 1 miles away. This is a list of public art in the London Borough of Brent. Located at 51.5575, -0.27959 (Lat. / Lng. ), about 1 miles away. The Bobby Moore statue is a bronze sculpture of the former West Ham and England footballer Bobby Moore, situated outside England's national stadium, Wembley Stadium, in London. It commemorates the life of Moore, who captained the only England side ever to win the World Cup, defeating Germany 4-2 in the 1966 FIFA World Cup Final held in England at the old Wembley Stadium, demolished in 2003. Located at 51.5573, -0.2796 (Lat. / Lng. ), about 1 miles away. Wembley Park Cricket Ground was a cricket ground in Wembley, London. The first and only recorded match on the ground was in 1896, when Wembley Park Cricket Club played the touring Australians in what was Wembley Park's only appearance in first-class cricket. 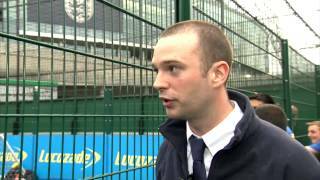 The ground was located in the northern park of Wembley Park, whole area where it was situated was developed for the British Empire Exhibition and Wembley Stadium and where the ground stood is today covered by the Wembley Retail Park. Located at 51.5598, -0.2768 (Lat. / Lng. ), about 1 miles away. Preston Park is a 7.5-hectare public park in Preston in the London Borough of Brent. It is Green Flag accredited. It is a grassed area with scattered trees, with two sports pavilions and a children's playground. There is access from Carlton Avenue East, College Road and Montpelier Rise. Located at 51.5706, -0.302778 (Lat. / Lng. ), about 1 miles away. These districts belong to Wembley. These are districts that are close by, but belong to a different city than Wembley. These are some bigger and more relevant cities in the wider vivinity of Wembley.